Rinse and de-stem grapes, pat dry. Spread in a single layer a baking sheet, then place in the freezer at least 2 hours before serving. In a large glass pitcher, combine 1/2 of the orange slices (reserve the second half for serving), lime, and lemon slices. Add the brandy and cinnamon stick and stir gently to combine. Slowly pour in the wine. Refrigerate sangria for at least 2 hours or overnight . When ready to serve, add the ginger ale to the pitcher and stir gently with spoon. To sugar the glass rims, place the colored sugar on a plate, then rub an orange slice around the glass rim. Dip the rim of each glass into the sugar, coating well. 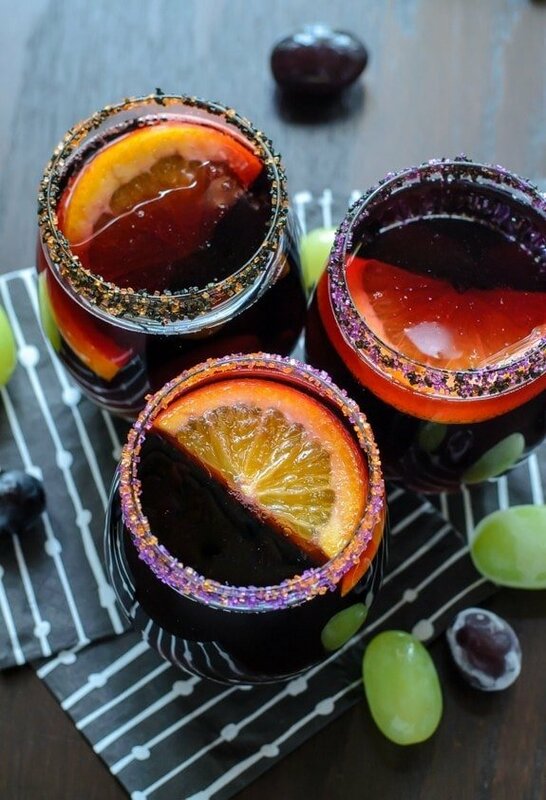 Fill glasses with frozen grapes and reserved orange slices, then slowly pour in the sangria. Cheers and Happy Halloween!